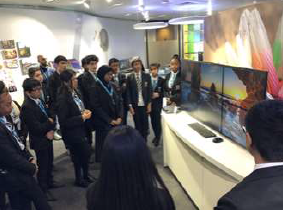 On Monday 25th February a group of Year 9 students visited the central London offices of Hewlett-Packard to take part in their World of Work scheme. 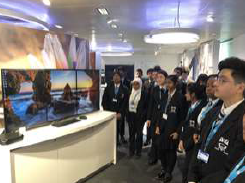 As one of the world's leading technology & electronics companies this was a fantastic opportunity for our students to learn about the competitive environment of big business and what it takes to make a career in this field. The day started with a series of talks from some of the HP managers and new recruits telling their stories of how they moved from education into their careers. The students were able to hear how people from all different backgrounds, both socially and academically, had succeeded in reaching their goal of working for a world leading technology brand. 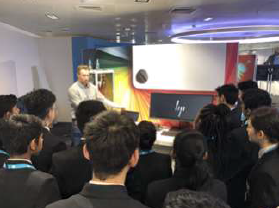 After a filling lunch the students were given a tour and demonstrations of some of HP's latest technology, including 3D Printing, VR and digital mapping used by some of the world's leading scientists. After this students were put into groups and were each given a piece of hardware which they could use and research before providing presentations to the rest of the group. Well done to the group of Biraven (9CRW), Sarathraj (9SYI), Yugkumar (9ICG), Dhruv (9RKM) & Jaleel (9SYI) for a winning presentation, rewarded with some well-earned chocolates. All the students involved represented Whitmore superbly and hopefully learnt a lot about what is required to move into the world of work after their education.